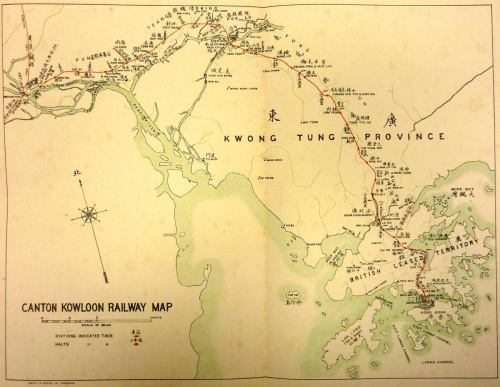 Tymon Mellor: With the opening of the Hong Kong section of the railway on 1st October 1910 and the mainland section 12 months later, Hong Kong was now part of the expanding Chinese railway network. This would link Hong Kong to the new Chinese markets; bringing huge changes to the region and the world. Unfortunately, the world did not change as anticipated with civil strife blunting the pace of development, however the railway still grew and prospered. This report covers the time from opening to 1940. The KCRC was designed as a link to Sham Chun (Shenzhen), Canton and beyond. The line would be a feeder for the industrial development of southern China and connect into China’s great north south railway lines. 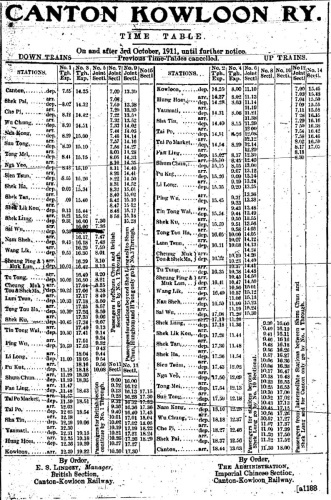 In the first year of operation, with little domestic market and the Chinese line still under construction, the initial timetable of 1910 provided only two/three trains a day and one on Sunday in each direction. However, by the end of the first year of operation, 1911, the company had generated revenue of HK$107,398 from a patronage of 319,778 while incurring expenditure of HK$100,087; as most of the revenue was from local traffic the company’s results were deemed, “very satisfactory”. The line was proving more popular with Hong Kong passengers than forecast. With the completion of the Chinese section of the line the timetable was revised to provide five trains per direction each day. The trains served the seven stations in Hong Kong and 27 stations in China. In 1913 a halt [trains would only stop if requested] was provided at Sheung Shui where the new road crossed the tracks. 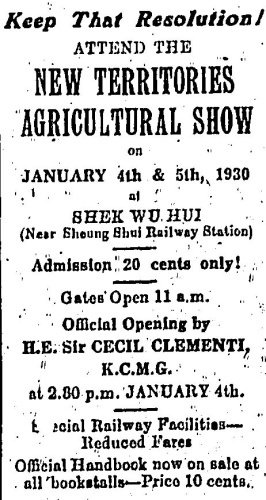 The stop was provided for the benefit of local people, golfers travelling to the recently opened Fanling Course and, later, would serve the Kwanti Race Course (from 1926) and the annual agricultural show at Shek Wu Hui. In 1921, in a response to requests from villages a second passenger halt, Che Kung Miu, was established near Bridge No 12 (mile 6.14) . Three passenger trains in each direction a day would stop to pick-up and drop-off. This halt would eventually become Tai Wai Station. During the early 1920’s the timetable and train services continued to expand such that by 1925 there were eight trains in each direction and by 1939 the daily line operations had increased to 16 local passenger trains, two freight trains and fourteen rail-bus journeys. Patronage from the Chinese section of the line was variable and depended on the stability of the region. Even in the first year of operation 1911 the trains were suspended between the 7th and 14th of December 1911 due to local disturbances. This trend would continue, ebbing and flowing with the civil disorder and lawlessness within Southern China. In 1919 the Chinese section announced that all Chinese railways would adopt the metric system from 1921 onwards. Hong Kong agreed with this arrangement and the railway was converted to metric. The track was no longer 4ft and 8½ inches but 1435mm; however, the measurement of distance in milestones continued along with speed in miles per hour. Collection of tickets was undertaken on the train although this proved difficult to control and was open to abuse. As a consequence, from the 17th August 1925 tickets were collected at the station and this proved to be “highly satisfactory” in comparison. The soldiers then continued to run the Chinese section of the railway and the systems fell into disrepair. By the end of 1923 Lo Wu became the terminus while military patrols were implemented to stop Chinese soldiers from crossing the border. The situation did improve and some intercity services resumed, but the track remained in poor condition due to the lack of maintenance and spares. Odd incidents continued with, in September 1925 the kidnap of two train drivers and a fireman at Shau Tau Kok; thus forcing the operator to stable trains away from the border areas. Perhaps the oddest incident occurred in April 1927 when a Chinese engine arrived in the Colony without either driver or fireman. The action was attributed to disaffected employers of the Chinese section of the line though, fortunately, the train ran out of stream and came to a stop without causing any damage. 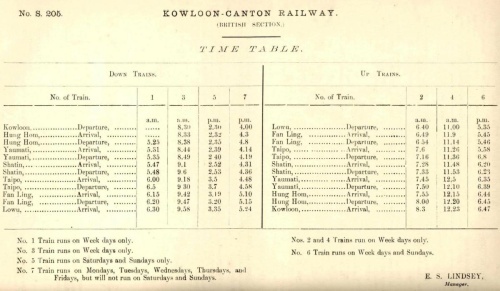 In the early 1930’s the Chinese undertook a track rehabilitation programme which allowed train speeds and punctuality to improve such that by 1933 the journey time between Kowloon and Canton had been reduced from 5½ hours in 1930 to under 3 hours. 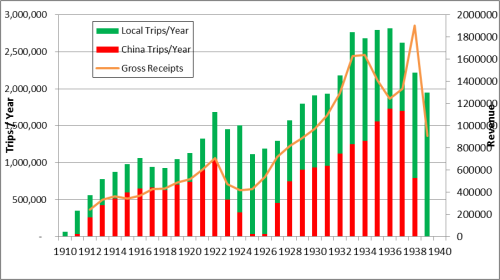 Through traffic struggled during the early 1930’s due to the Great Depression, and in 1935 by a complete failure of the fruit crop in Kwang Tung Province. 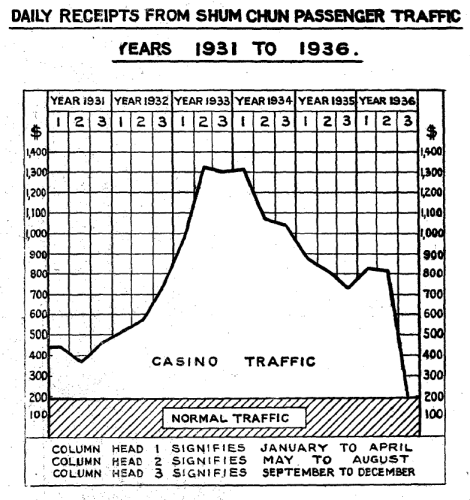 The opening of the “Shum Chun Casino” in 1931, provided one of the only new areas of passenger growth. By 1934 passengers visiting the casino were a major portion of the cross border revenue until its closure on 1st September 1936. The impact of the casino’s closure was such that there was a shortfall in the last four months of the year at round 30% of the net operating revenue. 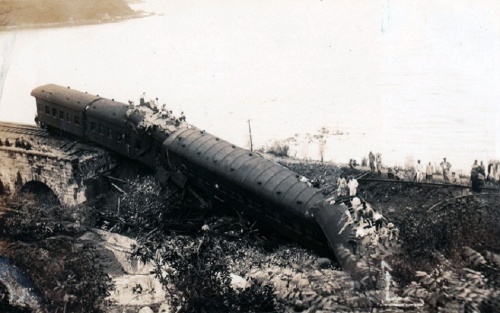 Things were to get worse when, in August 1937 the Japanese Sino war disrupted traffic, there was a major train fire which killed 84 passengers and storm damage which closed the Hong Kong section of the line for 8 days. Then things got even worse. 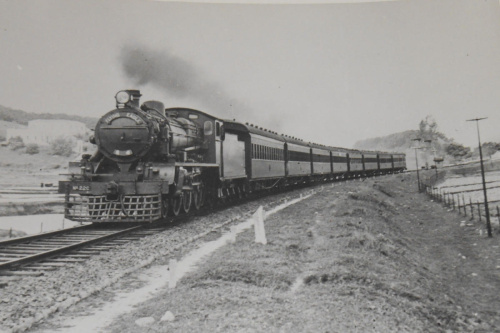 In addition to the closure of the casino in 1936, the revenue from freight dropped by 50% following the handing over of three express locomotives, which the British had operated and collected the revenue from, to the Chinese Section. In 1935, to improve the branding of the railway and provide distinction between the fast trains and the express trains, the four daily high speed services were given names; Fei Chin – Flying Arrow, Fei Sing – Flying Star, Fei Ying – Flying Eagle and Fei Lung – Flying Dragon. These proved popular with passengers. In the early years of the railway a number of studies were undertaken which identified possible additional branch lines. The Shau Tau Kok Line was opened on 1st April 1912, only to close on the 1st April 1928 when the line was replaced by a road. In 1917 a study was undertaken for branch lines to Tai Kok Tsui and Tai Wan Bay, including a detailed survey of the route. Planning for the lines continued through the 1920’s such that by the late 1930 the plans had developed into a line serving Kwun Tong and a new freight facility in Kowloon Park. 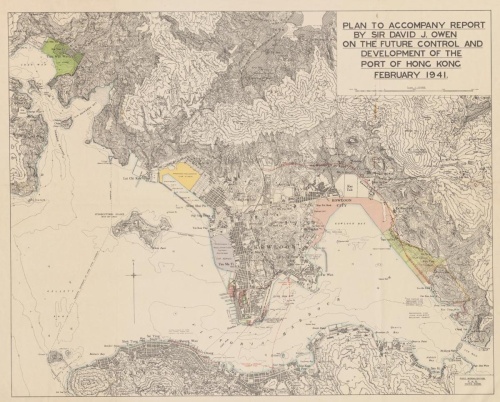 The alignments were presented in the study on the “Future Control and Development of the Port of Hong Kong, February 1941. Recognising the delay resulting from the impact of the war in China the report notes that, “It is expected that the railway, connected again as it should be with the Chinese railways, will be able to tap sources of trade, yet untouched, in rich territories in China and so tend to the expansion of the trade of the Port of Hong Kong”. The invasion of Hong Kong, ten months later in December 1941 put all plans on hold. On the opening of the railway, the KCRC owned four steam locomotives, two 2-6-4 Kitson side tank engines to haul the trains and two 0-6-0 Hudswell Clarke Saddle Tank engines for shunting. The latter had been purchased from the Kowloon reclamation contractor, Messrs Leigh & Orange. In addition to the four trains the Corporation had eight passenger coaches and 50 goods vehicles. Additional rollingstock was procured to meet the expanding demand giving, by 1920, a fleet comprising eight 2-6-4 Kitson side tank engines along with two further 0-6-0 Hudswell Clarke units. 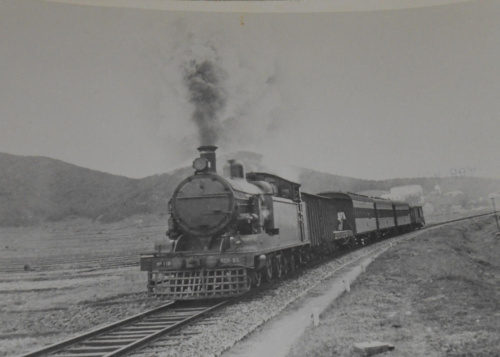 With the opening of the Shau Tau Kok Branch Line in April, 1912, three narrow gauge trains were acquired, two 0-4-0 Hudswell Clarke Side Tank and a 0-4-0 Orenstein & Koppel Centre Tank. These narrow gauge units had been used during the construction of the line. By 1923 a more powerful locomotive was required to pull the heavier trains and four 4-6-4 Baltic Side Tanks units were supplied by Kitson; the operator was “more than satisfied” with their performance. 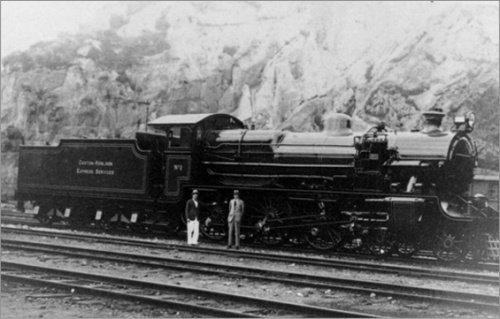 Until 1927 the Hong Kong locomotives would terminate their service at Shum Chun (Shenzhen) where Chinese locomotives would then take over for the remainder of the Kowloon Canton route; however, due to on-going troubles the Chinese locomotives were in such a bad state of repair that from the 1st June 1927 the British engines were permitted to drive all the way to Canton, typically completing the 111 mile journey in 3 hours 45 minutes. To allow the Kitson engines to complete the longer journey, in 1927 a new water tank was added as a separate trailer car behind the engine and the side water tanks removed from the main body. The arrangement was “highly successful”. Following discussions with the Chinese section, the KCRC purchased three new 4-6-0 Pacific Kitson locomotives for the Kowloon-Canton service. These engines would then be rented back to the Chinese section at a monthly payment of $10,000 until the cost had been covered. The new trains arrived in the Colony in August and September of 1930 and were ready for trials in December 1930. Unfortunately, the Chinese track, requiring extensive sleeper replacement, was considered unsuitable for the operation of the new trains. The locomotives eventually undertook their trials in China in April 1931 and entered service in May 1931 and were described as “both efficient and economical”. The improved performance provided the possibility of reducing the journey time to three hours. In an attempt to reduce operating costs, in May 1921 the KCRC ordered two Hall-Scott Motor coaches from the US. These vehicles consisted of a petrol driven car with a trailer unit and would be cheaper to operate than a traditional steam locomotive with carriages through the sparsely populated New Territories. These units arrive in September, 1921 but did not enter revenue service until June 1922 due to the unexpected time required to train drivers and operate the vehicles. After initial teething problems the vehicles, were described as having kept “excellent time and… given complete satisfaction”. 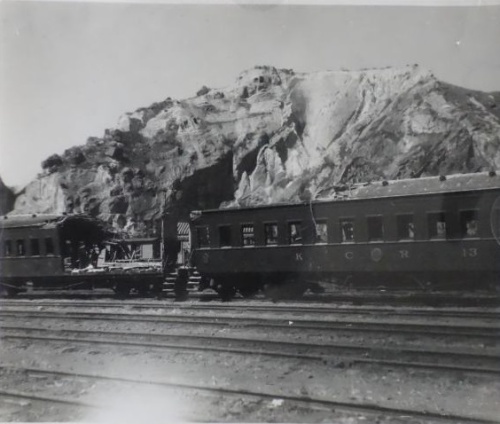 The vehicles had a chequered operational history with a serious crash in July 1922 when a motor coach went through a wrongly set turnout at Fanling Station, this necessitating the rebuilding of the vehicles front. Also, in December 1923 both motor units broke their crank shafts, while in 1929 a motor coach broke an axle which caused the derailing and overturning of the vehicle. In early 1936 a review of the two motor coaches was undertaken. The report concluded that although the motor coaches had operated well they were unable to generate a profit due to their limited operational miles. It was decided to convert one coach into a streamline luxury parlour observation railcar. The vehicle was totally rebuilt and refurbished to the extent that it included a separate cocktail bar and smoking lounge. The interior was lined with French polished teak wood and deep-padded armchair type seats were fitted. The exterior was finished in a blue and silver livery. The coach named the “Taipo Belle”, proved particularly popular with weekend golfers on their way to Fanling golf course. 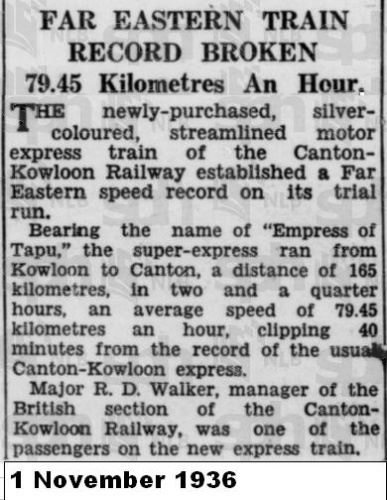 On 14 October, 1936 the Taipo Belle made a record breaking run to Canton in only 2 hours 15 minutes, a time which compares very favourably with today’s through train services. The second motor coach was used to explore the feasibility of a shuttle service between Sheung Shui and Tai Po Market; catering for “country people carrying market produce”. The experiment lacked the necessary support and by the end of 1936 the coach was also given a similar facelift. The newly named “Canton Belle”, entered service in 1937 and was finished in a dark green and silver livery. With the interest in the luxury travel market, an air-conditioned lounge car called “Aurora” was constructed in the railway workshops, the air conditioning relying on ice to generate the cool air. The vehicle was an instant success when introduced on the Canton run on 11th May 1937. There was a great demand for the seats and a 50 cent booking fee was introduced. Unfortunately, due to the hostilities between China and Japan, the service was withdrawn on 24th September 1937. 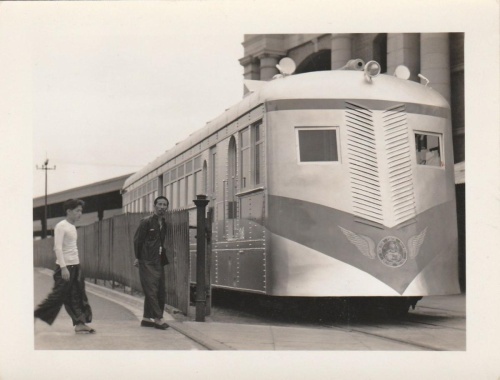 Despite the earlier attempt with the Hall-Scott railcar in 1937, a rail-bus service between Tai Po Market and Fanling, was introduced from the 1st May 1937. The shuttle service had two intermediate stops, operating seven times a day in between the regular service. The rail-bus vehicle was constructed in the Hung Hom workshops and consisted of two 3-ton Bedford lorry chassis welded end to end. The body was designed to carry 45 third-class passengers with their agricultural produce. It was fitted with wide central doors and corridors to facilitate easy movement. The rail-bus was powered by a six cylinder petrol engine driving pneumatic tyres while cast steel discs held the vehicle onto of the rail. This was believed to be the first rail-bus in China. The vehicle could achieve a maximum speed of 37 miles per hour and was noted for its “remarkable powers of acceleration and deceleration”. The service operated until the war, then returned until retirement in 1961. 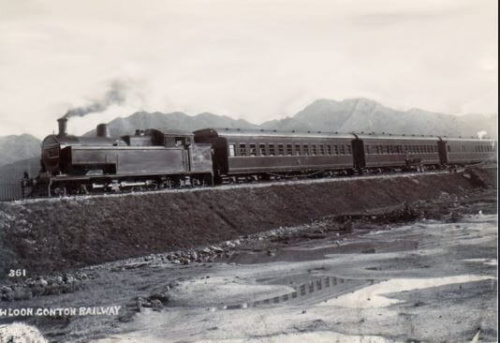 The Kowloon Canton Railway was built, primarily to move freight, to bring goods from the Chinese hinterland to the coast and the international shipping lines. In 1937, after years of discussion a connecting loop was constructed between the Canton-Hankow railway and the Canton-Kowloon Railway. This allowed goods trains to travel the 791 miles between Kowloon and Wuchang and connecting in to the greater China railway network. Despite these grand ideas, most of the freight carried was sourced locally. By 1936, the last normal year before the disruption of war, most freight related to a special vegetable train which run daily. However this was cancelled as the produce was able to be carried on the normal down train. The total local freight demand for the year was 21,239T heading north and 21,512T heading south. 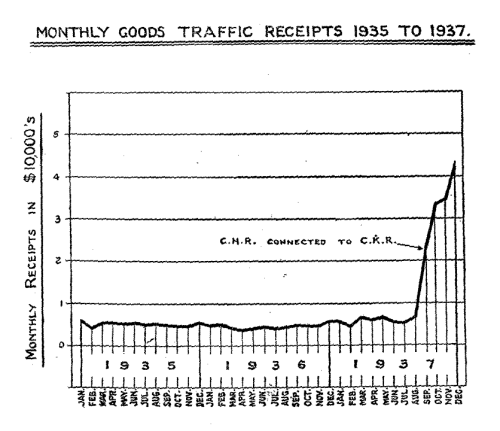 In the same year 1936 there was a reduction in cross border traffic with a decrease in the out bound freight of 3,002T (from 12,132T) due to a reduction in rice, cement and fertilizer exports. The incoming freight was 6,435T, around half the export value. The variability in the demand was highlighted with an example in May 1936 when the export of salted fish from Tai Po to China stopped. It was discovered the fish was being smuggled through Sha Tau Kok to avoid the Customs authorities. Each year there were a number of incidents on the railway. Typically there would be a few derailments resulting in some damage, but no major injuries. There were also regular fatalities, normally three or four a year; usually trespassers being hit by trains or people falling from moving trains. Although infrequent, there were a number of major incidents and these are described below. 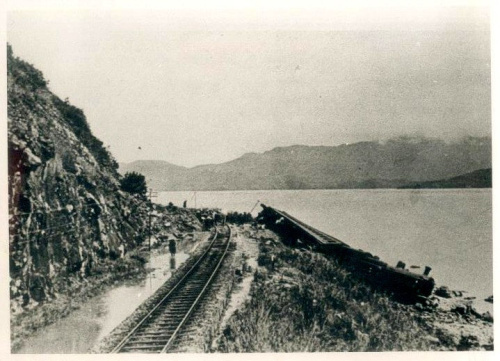 On the 14th June 1923, following exceptionally heavy rain, a landslide occurred at Mile 10½ (Ma Liu Shui) resulting in hundreds of tonnes of earth slipping from a side cutting. The collapse, at 11:00am, occurred just as a train was passing and resulted in the derailing the train with the locomotive and front coach rolling down the embankment. Fortunately no one was injured. Rail traffic resumed within 24 hours and the locomotive was recovered, repaired and re-entered service; although in 1931, this same locomotive was involved in a second incident. 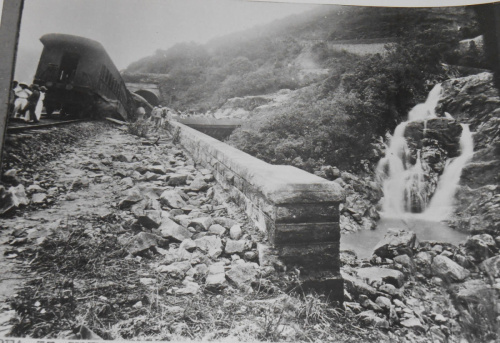 In the afternoon of the 20th April, 1931 a cloud burst caused huge volumes of water to fill the mountain streams. At bridge number 22, south of University Station the water scoured out 36m of the railway embankment leading to the bridge. 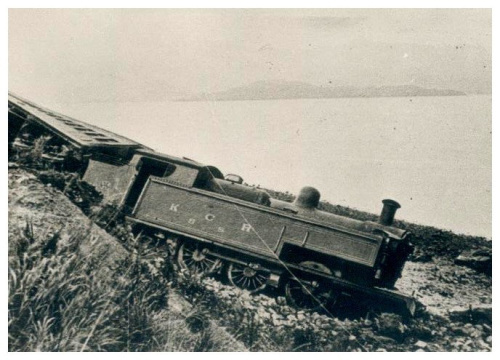 As the Kowloon bound train approached at about 5:10pm the damaged embankment collapsed, leading to the locomotive and the first four passenger carriages derailing and falling 6m down the embankment; carriages three and four telescoping into each other. Until this incident, the railway had carried 24 million passengers without serious injury or loss of life; however, the 1931 derailment resulted in 12 deaths and eight serious injuries. 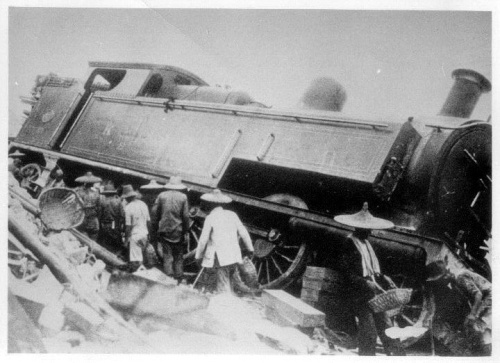 The incident was compounded by damage to telephone lines making initial communications impossible and the same cloud burst resulted in other washouts preventing a relief train reaching the disaster. Road access was hampered by the collapse of a road bridge to the south and to the north the road was obstructed by flood debris. As a consequence, it would be two hours before help would arrive, the injured being rescued by local residents and other passengers. Following repairs to the embankment and track, the line resumed operation on the 3rd May 1931. 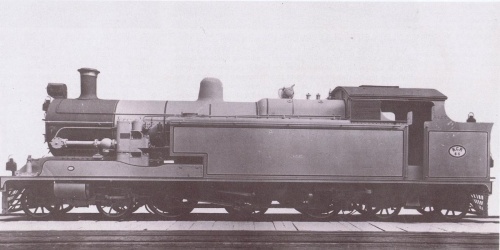 The locomotive, the same one as in the 1923 derailment, was stripped down; the frame straightened as far as possible and the engine re-built. The locomotive was removed from passenger services and allocated to freight and ballast maintenance. On the 16th January, 1937 a fire occurred on an express passenger train heading towards Canton. The fire originated when the train was 36 miles to the south of Canton and just south of Shek Lik Kou Halt. Following the report of the fire the train was brought to a stop within 5/8th of mile; however, this prompt action was insufficient to prevent a serious incident. The fire, within the three third class passenger car resulted in 84 deaths,30 serious injuries and destruction of the carriages. The most striking feature of the fire was the speed in which it spread. The outbreak occurred in the third coach from the engine where practically all the casualties were found. A survivor described, sheets of flame shooting across the carriage from door to door. A later enquiry concluded that two baskets containing 320 dozen celluloid bangles were loaded on the train at Shum Chun and these highly inflammable articles were the cause of the fire. As there was no goods invoice for the bangles it was not clear how they got on the train and arson was strongly suspected. Following the fire a number of safety measures were implemented including installation of fire extinguishers, the fitting of clerestory windows and changing sliding doors to swing doors in the third class cars. 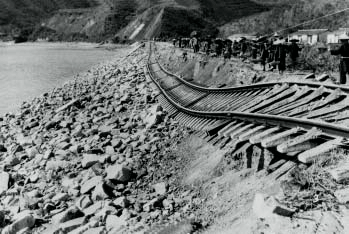 Every year the railway was exposed to storm damage resulting in landslides or washing away of the embankments. One of the most notable occurred in the early hours of 2nd September, 1937 when the Great Hong Kong Typhoon, the worst in the recorded history of the Colony with wind speeds of up to 167 miles per hour (269km/hr) struck. The typhoon caused the deaths of 11,000 people. Many of these occurred when a 9.1m tidal wave that swept through the Tolo Harbour swamped the villages of Taipo and Shatin. 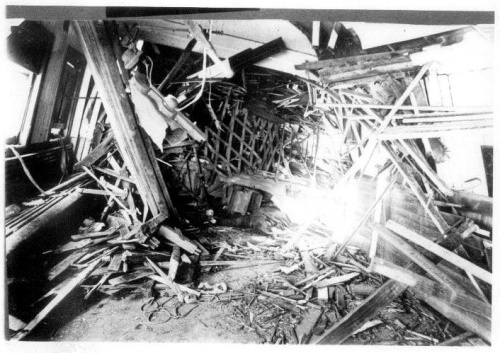 The villages suffered massive damage and many fatalities. The wave also washed away 1,800m of embankment between Shatin and Taipo Market leaving the rail tracks hanging in mid-air. It was described as “The worst cataclysm which has ever befallen the railway”. The train service was suspended until the 13th September 1937 when normal passenger service resumed. Between the 2nd and 10th September an average of 2,000 coolies, working day and night, were employed to repair the damage. A ballast train was able to pass through on the 10th September to reset the track and limited passenger trains commenced the next day. The imposed speed restriction over the new works remained in place until 8th November 1937 and all remedial works had been completed by the 24th November 1937. In 1937 the Sino-Japan hostilities started to impact railway operations, cross boarder services were disrupted for 7½ days due Japanese air-raids and all the available storage space was occupied at Kowloon with goods diverted from Shanghai. Special train services were operated to support the military camps and returning military personnel who been isolated. Three special trains protected with British flags on top of the coaches were operated to transport personnel to Hong Kong from the ensuing violence in China. From mid-October, 1937 the Japanese started bombing the Chinese section of the railway. A total of 726 bombs were dropped from 344 planes in 81 raids on 49 different days. Using 60kg, 250kg and 500kg bombs. 140 were dropped on the two large bridges over the East River at Sheklung, none hit the structures but the service was disrupted when they hit deep embankments. The Chinese railway operator quickly restored the line. During an air raid on the 24th October 1937 two Hong Kong coaches were hit and seriously damaged by bombs along with one locomotive and seven wagons hit by machine gun fire. There were no casualties but, as reported, “As a result of the bombing, punctuality figures, both local and foreign, have suffered severely”. During 1938 railway operations had picked up and a bi-weekly services was introduced on the 14th July 1938 between Hong Kong and Hankow. With the intensification of the Sino-Japanese conflict and the dropping of 1,490 bombs on the Chinese section of the line the new Hankow services creased on the 7th October 1938. On the 21st October 1938, following the Japanese capture of Canton all services were abandoned as the Chinese staff scattered. As the Chinese military forces retreated north they demolished the key railway structures, including many of the longer bridges. Despite this loss of through traffic, the Hong Kong section of railway experienced a record year. 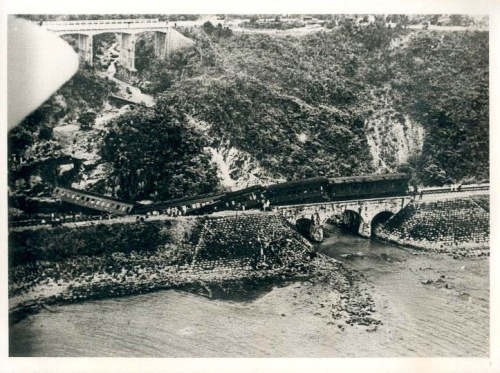 The Japanese occupation of Canton resulted in an influx of refugees to Hong Kong and temporary camps established using spare railway vehicles in sidings at Fanling and Gills Cutting (north of Tai Po). 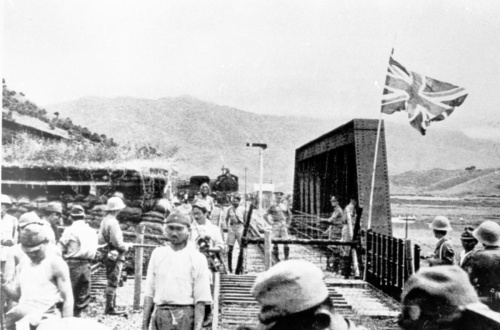 With the Japanese consolidating their occupation a new border fence was hastily established at Lo Wu. On the 21st February, 1938 three Japanese planes, “inadvertently crossed the border. Four bombs were dropped on Lowu Station yard and two near a local passenger train one mile south. There were no casualties among railway staff or passengers, but eleven other persons were killed”. The damage to the railway property of $8,428 was paid for by the Japanese Government. 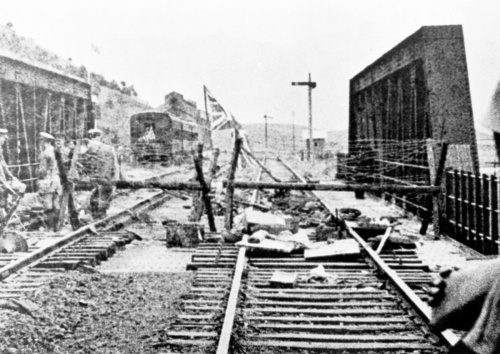 At the request of the British military, the border railway bridge and adjacent road bridge were dismantled between 23rd and 27th August, 1939. The railway continued with just a domestic service. As recorded by Robert J Phillips plans were in place in the event of a Japanese invasion, so on the 8th December, 1942 as the Japanese crossed into Hong Kong a special train carrying explosives and a team of demolition experts from the Field Company Engineers of the Volunteer Force led by Major J H Bottomley proceeded from Lo Wu southwards, placing charges as they went. Bridges 47, 33, 25, 24 and Gills Cutting on the section between Tai Po and Lo Wu were demolished. Wagons of explosives were then detonated inside the Tai Po and Beacon Hill tunnels, causing severe damage to the brick arches and blocking the tunnels. All railway operations were suspended, equipment immobilised to prevent its use by the Japanese and the railwaymen were dismissed. The railway was closed. This article was first posted on 10th March 2016.